This light Umbrian inspired dessert is perfect for enjoying with friends on a warm summer night. The combination of silky ricotta cheese and crunchy sweet peaches, flavored with just a hint of almond is something everyone needs to try at least once. Though I used peaches for this pie, I'm sure it would taste equally delicious with nectarines, apricots or even cherries. Place the flour, sugar, salt, baking powder, and citrus zest in the bowl of a food processor and pulse several times to combine the dry ingredients. Add all of the cold, cubed butter to the bowl and pulse to process the mixture until it is sandy and there are no visible lumps of butter. In a small bowl, whisk together the egg, egg yolk, vanilla, and heavy cream. Add the wet ingredients tot he food processor and pulse 3 or 4 times, or until the dough comes together. If necessary, add some ice water, a few drops at a time, to make the dough come together. Remove the dough from the food processor and work it with your hands to even out any dry and wet spots. Form the dough into a ball, flatten into a disk, wrap in plastic, and chill until firm, 1 to 2 hours, before rolling out. You can freeze the dough well wrapped, for up to 2 months. Blanch peaches in boiling water, peel and cool. Reserve 1/2 of the peaches for topping, slicing the remaining peaches. Butter a 10" tart pan. Roll out the dough, line pan, pressing dough into place and pierce with a fork. Trim excess dough from edge. Line with wax paper and weight down with beans. Bake 15 minutes in a preheated 425 degrees F oven. Remove wax paper and weights and bake 5 more minutes. Combine ricotta and sugar in a food processor until smooth, adding the cream slowly until whipped. Add almond and vanilla extracts and mix. Add the sliced peaches and pour into the shell. Place the reserved 1/2 peaches on top and arrange slices all around the edge. This is a peach pie I can get on board with. Never tried ricotta in a pie before, but it definitely looks delicious! Looks delicious! Such a perfect pie for summer. 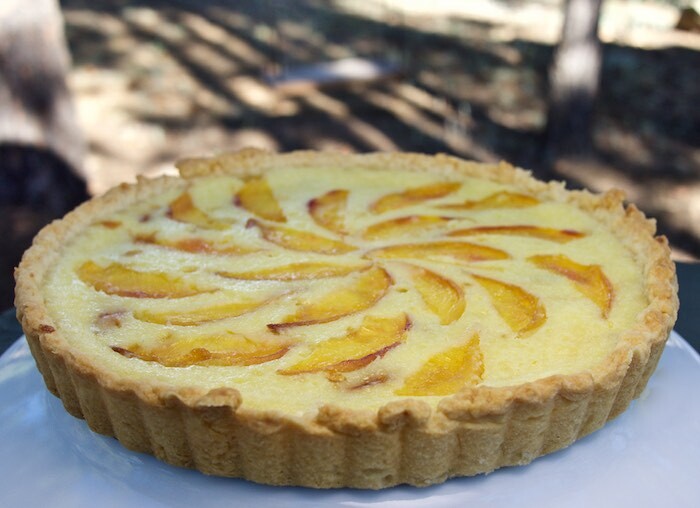 What a delectable combination of peach and ricotta! I need a slice of this in my future. Looks very tasty! Slurp! I am gonna make it at home. Thanks for sharing. Ricotta and peaches? That sounds soooo incredible. I do not eat flour, but I am guessing this is just as delicious without the crust. I might just have to find out. I love ricotta and peaches together! ooh! Ricotta! I love ricotta! I don't eat flour but I could use my favorite nut crust for this. YUM!! Swoon! This sounds amazing! I love this flavor combo idea AND that it's in a pie. Yum! This recipe looks AMAZING!!! Such a fun concept!